It can get confusing to know which fats are best to eat and cook with. To help with that, we created an interactive infographic for you to visualize key points about some of the most popular Paleo fats. 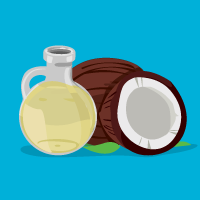 There are other good fats out there, but we focused on a few important ones. 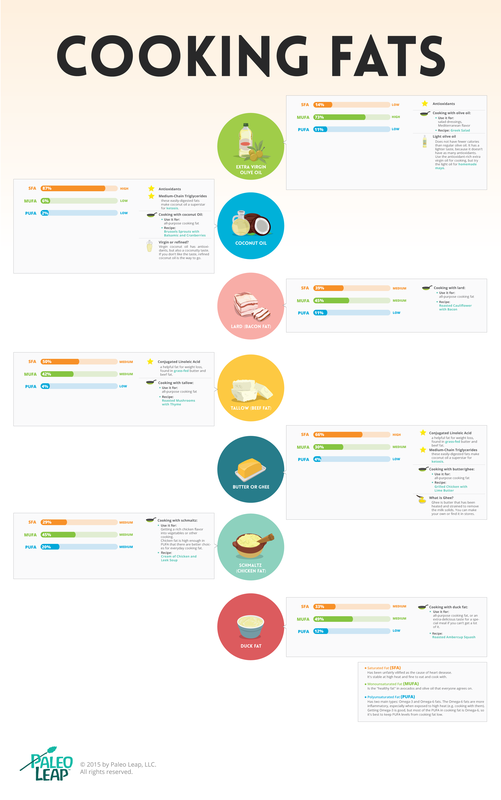 In the infographic, click on each type of fat to get the detail card. You can also access an alternate version here if, for some reason, you can’t view this version properly in your browser. Has been unfairly vilified as the cause of heart disease. It’s stable at high heat and fine to eat and cook with. Is the “healthy fat” in avocados and olive oil that everyone agrees on. Has two main types: Omega-3 and Omega-6 fats. The Omega-6 fats are more inflammatory, especially when exposed to high heat (e.g. cooking with them). Getting Omega-3 is good, but most of the PUFA in cooking fat is Omega-6, so it’s best to keep PUFA levels from cooking fat low.